The industrial world of Veloma is a central reservoir of power for its sector, administered by the Hapax Corporation on behalf of the Galactic Empire. The planet is famous for the massive core-tapping reactors known as the Atom Furnaces, devices of incredible engineering prowess but which have ravaged the world's atmosphere to the point where the surface has become uninhabitable and the atmosphere itself a brown, soupy gunk. Its inhabitants and the cities they live within are buried beneath the crust of the planet, serviced by incredibly efficient hyper-rail services which whisk workers from one side of the planet to the other; each of the Atom Furnaces are often thousands of kilometres apart, and small city-sized plants and offices service the operation of these colossal machines. 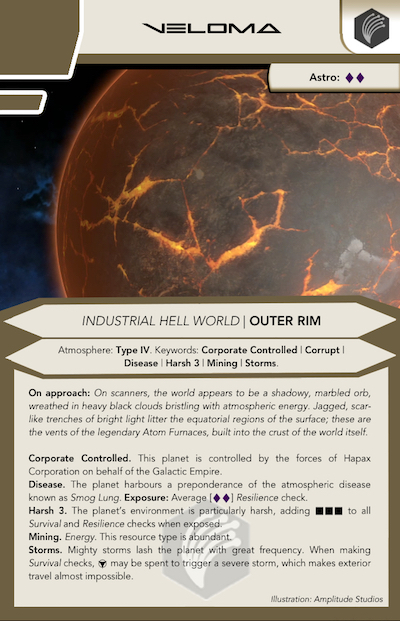 Veloma has an unusually high preponderance of a generic atmospheric disease known as 'smog lung', common to planets with atmospheres that are largely poisonous to most sentient species of the galaxy. Veloma's particular atmosphere is actually habitable to the natives of the planet Gand, who can breathe on the planet's surface with some difficulty but, thanks to the high ammonia levels, do not suffer smog lung as many others do after repeated exposure. Much of the planet's surface is affected by acid rain, and high-velocity winds make travel to the planet difficult and occasionally dangerous. During particularly savage storms, interplanetary travel is impossible by anything other than the most massive starships. The Czerka Corporation has long been known to harbour designs on wresting control over Veloma from the Hapax Corporation, a move which Hapax have resisted for decades. In particular, Czerka are interested in acquiring the design patents for the Atom Furnaces themselves, with the intent of rolling out such technology on other planets.